Artwork Panel: 32cm x 135.5cm ≈ 12½" x 53¼"
Silk/Brocade: 41.2cm x 192cm ≈ 16¼" x 75½"
Width at Wooden Knobs: 50.2cm ≈ 19¾"
This is the roughly-translated English meaning for the Chinese title of this piece. The Chinese title is "Xia Yu" which is the simple title written vertically in the upper left of the painting. See the two largest characters - that's the title. The characters following the title are simply the year painted (2007) and the artist's signature. This is a simplistic painting style, but it also incorporates a lot of detail. 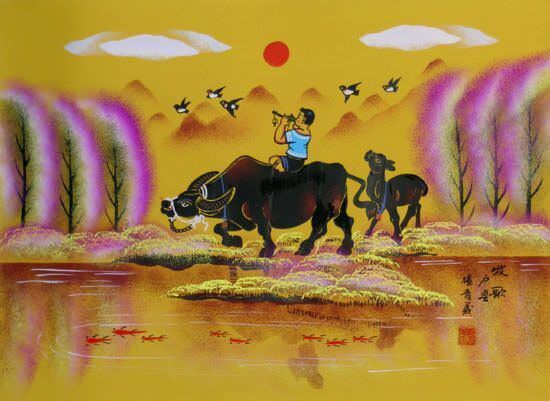 This painting really mimics the style of Chinese artwork that has been around for thousands of years. This artwork is completely hand-painted, and is mounted to a handmade silk wall scroll in our workshop. The artist's name is (Wang Jian-Qiu). He lives in Jinan, the capital city of Shandong Province in Northern China (about 5 hours south of Beijing). I was introduced to this artist's work at Qin Xia's studio in Jinan. This artist has been a long time friend of Qin Xia (You may recognize Qin Xia's name from artwork in our flowers and birds category). Wang Jian-Qiu also does some great detailed beautiful woman paintings, and occasionally does some landscapes for us as well.